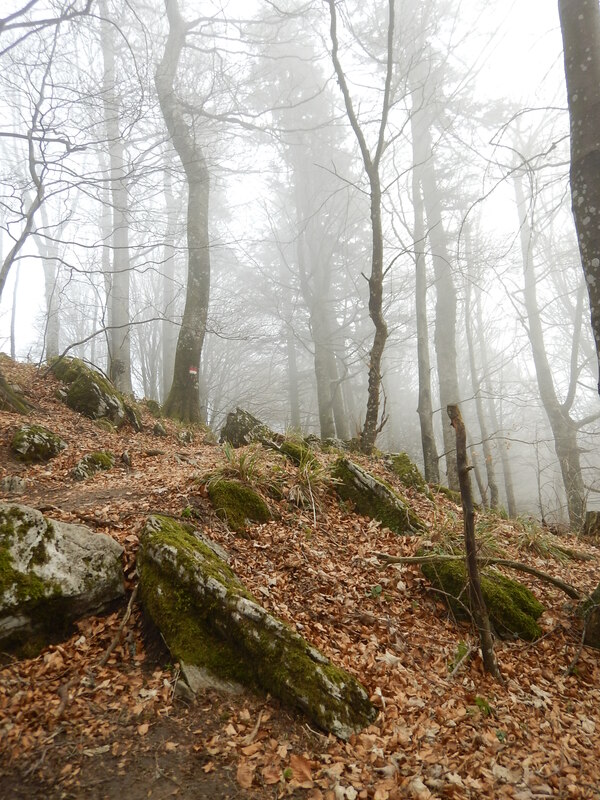 La Verna is a Francescan sanctuary located on an isolated mountain, high in the Apennines. The location is breathtaking. The monastery itself is beautiful in an austere, Romanesque and early Renaissance sort of way, although this can be deceptive, because, the basilica and all the little chapels have the most glorious Della Robbia ceramics. You just have to open a small door to find another of these pieces right in front of you. The only other people there yesterday, when we visited, were a small party of women – a couple of mothers, a grandmother – and children. Every other time I’ve been there it is has been quite crowded, but perhaps being a weekday made the difference (on weekdays, for example, masses are held in a chapel rather than in the basilica, and, in my experience, they are always very well attended when in the latter). 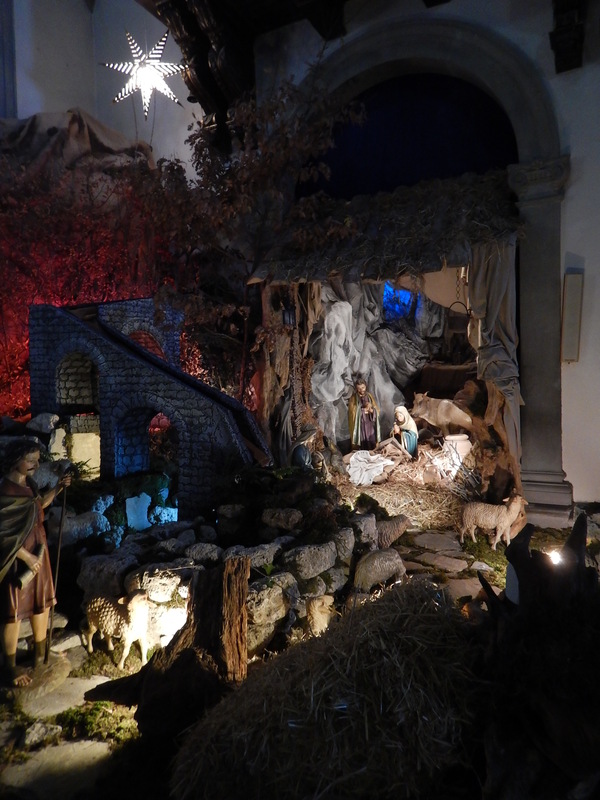 In the basilica what held the attention of all of us visitors was the presepio (the nativity). Presepi are everywhere in Italy, but I’ve never seen one quite like this. The children were loving it, and, much to the consternation, and amusement, of their mothers, they kept escaping under the rope that had a notice warning that it was alarmed (although apparently not). This presepio was set in the rocks and forests of the sanctuary, the large figures of Mary, Joseph and the shepherds carved in wood (there is a very old tradition of wooden sculpture in this area), and one shepherd was carrying a basket of eggs. There were lots of Tuscan sheep. Not surprisingly, these sheep are also present in Della Robbias on the walls, and, there was one in the vaulted ceiling above. Outside, the huge bell above the basilica was ringing for mass. The children were entranced, by the sound, and the appearance of it. Then when you look up, you see that there are smaller bells above every chapel in the sanctuary; they are everywhere! 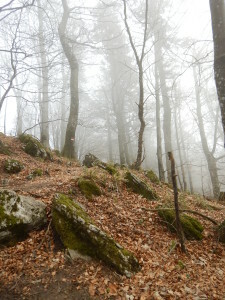 We headed up the steep path to Mount Penna, where St Frances had a hermitage. And, it was on this path that I had another meeting, in Italian, with a stranger. As it turned out, the young man was the only other person on the path at this time, and maybe this contributed to his friendly greeting. After ‘bella giornata’, he asked immediately if I was a pilgrim. ‘No’, I said, ‘on vacation, from Australia’. He wasn’t one either, but was here for the ‘clear air’, for few days from the Veneto. He told me that I’d come to one of the most beautiful places in Italy, and wished me happy holidays.